The DUFF: Designated Ugly, Fat Friend by Kody Keplinger. Grades 9 and up. Poppy (an imprint of Little, Brown), September 2010. Reviewed from ARC provided by publisher. When Hamilton High School's most promiscuous male deems Bianca the DUFF (Designated Ugly Fat Friend) of her group, Bianca throws her Cherry Coke in his face. But later it occurs to her that, between Casey, the modelesque cheerleader, and Jessica, the curvy blonde, maybe Bianca is the DUFF... And when things start to fall apart with her parents, Bianca is horrified to find herself swept up in a fling with Wesley the jerk. She hates absolutely everything about him... except for the way his kisses help her escape the stress in her life. But when Bianca finds herself thinking about Wesley more and more, she'll have to decide - when is enough enough? I found this book to be unexpectedly delightful. For some reason, even though it's been getting a fair amount of buzz around the KidLitosphere, I wasn't that intrigued by The DUFF before I picked it up. Maybe that stemmed from negative impressions of the cover (which definitely does not depict someone ugly or fat) or maybe it was the idea of an 18-year-old author that gave me pause. I figured I'd pick it up since Little, Brown sent it to me, and I'm so glad I did! 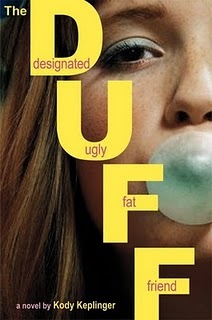 The DUFF is not just another fat-girl book (like maybe I'd suspected). In fact, The DUFF isn't a fat-girl book at all. It's a book about a normal teenage girl who's going through some issues and trying to deal with her stress. And she ends up choosing a somewhat destructive way to deal with her stress (as some teens are wont to do). But nothing's black and white here. As Bianca's fling with Wesley proceeds, they both begin to change their minds about each other. I love that Ms. Keplinger doesn't shy away from the complicated emotions that Bianca is feeling. She's able to explore this relationship without getting message-y and while providing a satisfying conclusion. And my qualms with the cover dissipated as I read the story. The book's not really about a fat girl. It's about those feelings that everyone has from time to time - feeling like you're not pretty enough, not thin enough, not smart enough... As Bianca works through her issues in the book, she comes to realize that everyone feels like they're the DUFF at some point. Though Bianca might perceive herself as ugly and fat, that doesn't necessarily make it true. I'd recommend this book to fans of Elizabeth Scott for the realistic characters and complicated emotions. I'd also recommend it to fans of Perfect Chemistry by Simone Elkeles for the unlikely (and somewhat steamy) romance element. Kody Keplinger's definitely a debut author to watch and I certainly hope she finds time between her college classes to keep writing YA novels! The DUFF will be on shelves September 7, 2010. I'm so, so, so happy you enjoyed it!!! This book is so fantastic and I agree with everything said here! Thank you for this fantastic review! I fell in love with this story immediately...I definitely felt like the DUFF in high school, and sometimes still do! Thank you, thank you again! So glad you enjoyed it!